Since olden times, before 1948, Hill states of Punjab (present day Himachal Pradesh or Pahari states) were well known for tradition of illustrious embroidery on articles made by women in their leisure time with great passion. The embroidery was seen on religious textiles, apparel and other utilitarian household objects. 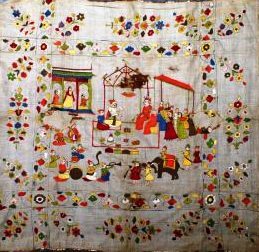 Since the Pahari embroidery was widespread in larger area, different styles of embroidery were discerned yet distinctive in treatments given to each one of them. 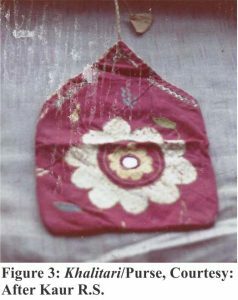 The most acclaimed were double sided embroidered coverlets and hangings known as dhkanu (square coverlets) or chhabu (circular coverlets) used for covering the ceremonial gifts as well as offerings made both for gods and rulers (Sharma, 2009). However, the other articles were equally fascinating but not much attention was given to their documentation in comparison to embroidered coverlets. The double sided coverlets are still made in Chamba but other styles of Pahari embroidery are no longer practiced. The present research paper focused on documentation of diverse range of stitches, textures and ornamentation used in different styles of Pahari embroidery. The unnoticed facets of the craft were observed in a detailed study of old rumals and articles in collection of various museums across the country as well as networking with the craftspeople in the area of the study. The main characteristics of the craft were identified on basis of styles of Pahari embroidery viz. single sided and double sided which were further categorized as technical and decorative characteristics. Pahari embroidery is a broad term which encompasses wide area where craft was practiced namely Hill States of Punjab (Himachal Pradesh or Pahari states) Chamba, Kangra, Nurpur, Basholi, Guler, Salyali, Mandi, Jammu, Kulu, Hoshiarpur, Bilaspur etc. The surface ornamentation of these articles with respect to design, raw material and technique were beautifully adapted according to their utility. A wide variety of products were made in embroidery each having special cultural significance in local traditions of Pahari region. For instance it was a tradition to offer an embroidered hand fan to the Lakshmi- Narayan deity of Chamba on the fasting day of Nirjala Ekadeshi, the eleventh day of the month of June (Sharma, 2005). A small square coverlet is also offered in Laxmi Narayan Temple, Chowgan Mohalla, Chamba which is still hanged from the dhoti of Lord Vishnu. It is evident that embroidered coverlets in different forms were used for covering ceremonial gifts and offerings for gods and rulers. Since their both sides were conspicuous, embroidered coverlets (Chamba rumals) were double sided (dorukha). They were locally known as dhkanu (square coverlets) or chhabu (circular coverlets) (Figure 1, 2). They were famed for their elaborate themes based on religion, socio- cultural traditions, literature, scenes from daily life and floral patterns. The compositions showcased magnificent blend of colors along with extravagant use of ornamentation and textures. Untwisted silk threads were used for embroidery on cotton fabrics of high thread count for fine workmanship of stitches. On the other hand additional articles were also embroidered which were meant for personal use and decoration such as cholies(blouses), caps, patkas (waistband), headress, book wrappers, chaupad, cushion covers, khalitari (purse) etc (Figure3,4). The present research focused on detail study of traditional articles made in embroidery which were both single sided and double sided. Wide range of museum specimen were studied and classified broadly on basis of face of embroidery i.e. single sided and double sided. Under each category they were grouped on the basis of their designs, raw material used, technical and decorative features. The information given below is shown in Table 1 for reference.Since they were used from one side they were embroidered in single sided stitches with specific design characteristics. 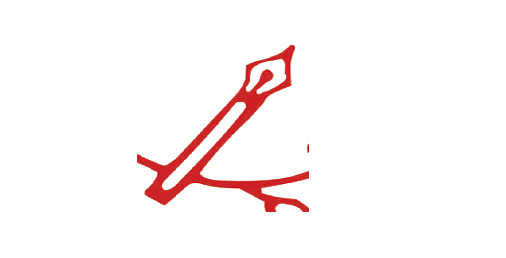 Usually, articles are worked differently unlike coverlets with respect to raw material, stitches, designs and motifs. Styles of embroidery according to designs: Designs and motifs in Pahari embroidery have deep rooted cultural significance. They were symbolic of the beliefs of the community who created embroidered masterpieces using the simplest of raw materials and stitches. The designs and motifs used were very specific to embroideries and characterized by the selective treatment given to them. This is apparent in Pahari embroidery where two different styles were discerned on basis of face of embroidery i.e. single sided and double sided. In single sided articles varied designs and motifs were imaginatively created in articles comprising of floral, bird animal which can be free hand curved designs and geometrical patterns. The designs in free hand curved designs were hand drawn and geometrical designs were worked by counting threads as in phulkari. In double sided articles, on the basis of the line drawing, embroidery stitches and subjects two distinct styles are evident (Pathak, 2010). The folk style of Chamba embroidery was characterized by limited subject matter, unbalanced composition, line drawing, use of bright colors and uneven long stitches (Pathak, 2010). The miniature style of Chamba embroidery was characterized by more detailed line work, use of soft soothing harmonious colors, balanced composition, rich subject matter and intricacy in embroidery stitches. The marked differentiation was due to the fact that folk designs were made by the embroiderers themselves based on their beliefs and customs (Aryan, 2010). On the other hand miniature style designs were commissioned pieces made by professional miniature artists. Fabric used: For embroidery two different types of fabrics i.e. muslin and khaddar in plain weave was used. For observations the photographs of old rumals were sourced from various museums, books, and personal collections of various people associated with the craft. In the analysis it was found that in muslin fabric, effect of embroidery was fine, executed in smaller stitch size and detailed. It was found most suitable since needle can pass through it easily and effect of embroidery was similar on both sides of fabric. In khaddar fabric, stitch size was bigger and found suitable for simpler, less detailed work or for utilitarian purposes with single sided embroidery. The detailing of figures, sharp pointed features of human face, fingers etc. were difficult to achieve. In khaddar fabrics the effect of embroidery was not similar and gaps were visible between stitches on the reverse side of fabric. It was also used for ease in counting of threads chiefly in geometrical designs in single sided embroidery. For single sided embroidery dark colored khaddar fabrics were used and in double sided embroidery unbleached fabrics were used. Embroidery Threads: Untwisted silk yarns were used for embroidery as they imparted smooth finish and uniform sheen to embroidery which resembled a painting effect (Ohri, 2001). For synthetic yarns mostly two strands (doura dhaga) were being used for filling and fine small areas were made using single strand of yarn (ekura dhaga). In case of silk yarns four to five silk filaments were slightly twisted together and used for embroidery. The gold and silver threads were used occasionally to heighten the effect of gold. At present, synthetic twisted yarn after unwinding was being used due to unavailability of untwisted yarns. When products made from twisted yarns after unwinding were washed in cold water, the same effect was achieved as in case of untwisted yarns. For folk style and single sided embroidery more fibrous yarns were used. Drawing (ulikan) of design on fabric: The tracing of the design in folk style and free hand curved design was done by the embroiderer herself or by some other experienced lady. 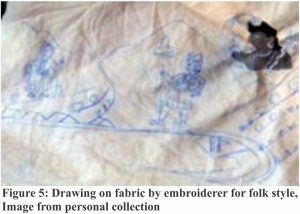 The drawing was sometimes made directly on fabric or traced (Figure5). The geometrical design was worked by counting threads. The usual method of drawing on fabric for rumals based on miniature paintings is as follows, the fabric was pasted on the ground with starch paste. 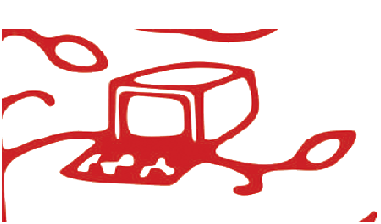 In first sketch, line drawing was made in red dye which was obtained from sindoor, in light watery color as this color does not show under final sketch. In final sketch outline was drawn in black color which was obtained from kajal or charcoal. The details were cleared and color preferences were marked for the embroiderers (Figure 6). Technical characteristics of embroidery: These were primary components while executing embroidery which included, different types of stitches, direction of stitches and outline stitch. Varied stitches were used for embroidery including double sided stitch (dorukha tanka), long and short darning stitch, satin stitches, running stitch (kacha tanka), cross stitch (sangal or dsauti tanka), buttonhole stitch (kazi tanka) and herringbone stitch (machi tanka). The main stitches used for filling were long and short darning stitch and encroaching satin stitches in both double sided and single sided embroidery. However, other stitches were used for outline and as finishing stitches which lend special features to both the styles. In single sided embroidery the stitch used for filling was single sided darning stitch in long and short stitches. The long and short stitches were taken in vertical rows from bottom to top. They were taken in such a manner that sometimes individual layers of stitches were formed or may not form. Small nips of fabric were taken as a result very small stitches were visible on back side of fabric. Another stitch used was satin stitch in same length stitches which was taken across and distinct layers were formed. The gap between layers was notable. This stitch was invariably used with geometrical patterns. In double sided embroidery the stitch most commonly used for filing was variations of satin stitch and darning stitch to achieve the effect of needle painting. In embroidery three different types of stitches were discerned namely long and short stitch, brick stitch and encroaching satin stitch. The long and short stitches further varied according to their length. In small length, the method of administering the stitch was same. The stitch length varied from 0.2cm to 0.4 cm. The stitch length was small resulting in uniform appearance due to closely packed yarns. In medium length, the stitch length was ranging from 0.5cm to 0.6cm. In long length, the stitch length was ranging from 0.8cm to 1 cm or even bigger, resulting in snagging of yarns and wavy appearance. In samples with long length stitches overlapping of yarns was seen. Furthermore, variations could be produced by varying the stitch size, spacing between the stitches and number of strands of yarns used for embroider. Also, many times different stitches were used together i.e. encroaching stitch was combined with long and short stitch. It was evident that variations in stitches would vary with each individual embroiderer. In embroidery, stitches were taken following the direction of yarns enclosed by a motif which can be vertical (rask-length), horizontal (aada- width), slant and multiple directions. Multiple stitch direction was more frequently used in folk style rumals. In single sided embroidery vertical and horizontal directions were mostly used. In single sided articles outline is done mostly done in all areas of design in yellow color in chain stitch, square chain stitch or running stitch. In double sided articles outline had a specific purpose and it was used in selected areas for highlighting, separating and defining designs and motifs. The commonly practiced stitch for outline was stem stitch (dandi tanka). However, it was observed in majority of earlier samples that running stitch (kacha tanka) was used for outline. Colors used for outline were in contrast to the colors used for filling in the figures. This was done to emphasize particular parts and standing out figures against the background. Subdued colors were also used that merge with the figures to achieve harmonial blending of the entire composition. 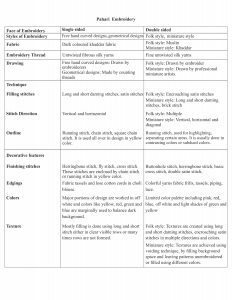 Decorative characteristics: These were extensively used in earlier articles to enhance visual appeal and aesthetics in embroidery like colors, ornamentation and textures, finishing stitches and edgings. In single sided embroidery, in free hand curved designs the base cloth used was khaddar dyed in shades of red and dark navy blue. For embroidery untwisted silk yarns were used predominantly in off white, red, orange, light and dark shades of yellow and green are marginally used to balance dark background. In double sided embroidery it was evident that limited range of color palette including pink, red, blue, off white, light and dark shades of green and yellow was used. In embroidered coverlets the color palette used for the embroidery could be identified from the border of the composition. Since border was always worked in last after completing central and field design and it showed all colors used. In single sided articles plain filling was done; textures were not much observed. However, in double sided embroidery, wide varieties of textures were studied. For instance, in folk style textures were created using long and short darning stitches, encroaching satin stitches in multiple directions and colors. In miniature style fine details and meticulous textures were made as attempt to create visual interest and add realism to objects as they exist in nature. The textures were achieved by technique called voiding where narrow gap was created between rows of stitches. Voiding technique was used to bring out fine details and separating areas without outlining. The outline was done only in outer parts and details within motifs were cleared using voiding. Textures were created by filling background in shape of motifs leaving them unembroidered or filled using different colors. This technique was used to create patterns in costumes of female forms and horse rider. Stitches were used to enclose the embroidery as well as used for finishing edges. The stitches used in double sided embroidery were buttonhole stitch, cross stitch, herring bone and double satin stitch. It was noticed that most of the times embroidery was finished leaving few inches from the outer edge. The outer edge was then folded neatly on the wrong side of the fabric with hemming (ulari). Interestingly in single sided embroidery herringbone stitch, fly stitch and cross stitch were used in narrow rows in double color. They were enclosed by chain stitch or running stitch in yellow color. 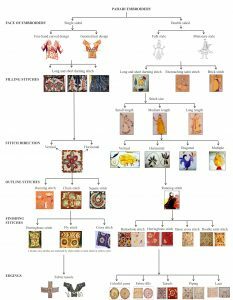 Edgings: after completion of embroidery, external edgings were used for decoration for instance fabric frills, tassels, colored piping and laces. Sharma, K.P. 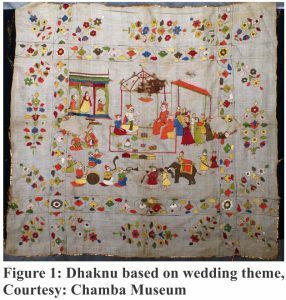 (2009) Wedding Scenes in Chamba Rumal and the Unusual Subject of Til-Chauli, The Diverse World of Indian Painting, New Delhi, p 143-149. 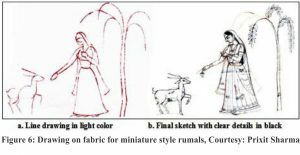 Sharma, V. (2005) Documentation of Decorative Motifs and Design in Hill Embroidery: Especially in Context of Chamba Rumal and Backless Cholis, Chamba Achamba: Women’s Oral Culture, Chamba, p 257-273. Pathak, A. 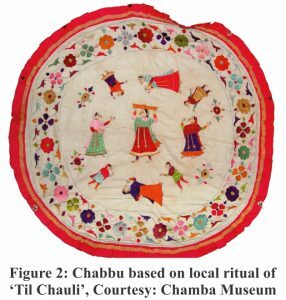 (2010) Chamba Rumal: Embroideries of the Himalayan Region, Annals of The Naprstek Museum, p 89- 110. Aryan, S. (2010) Folk Embroidery of Western Himalaya, Rekha Prakashan, New Delhi, p 8- 16. Ohri, V.C. (2001) An Inquiry into Aspects of Materials, Methods and History, The Technique of Pahari Painting, Aryan Books International, New Delhi, p120- 122. 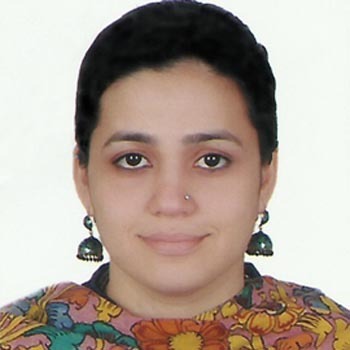 Kaur, R.S. (1995) A Visage of Embroideries of Himachal Pradesh, Department Of Textiles and Clothing, Lady Irwin College, University Of Delhi.